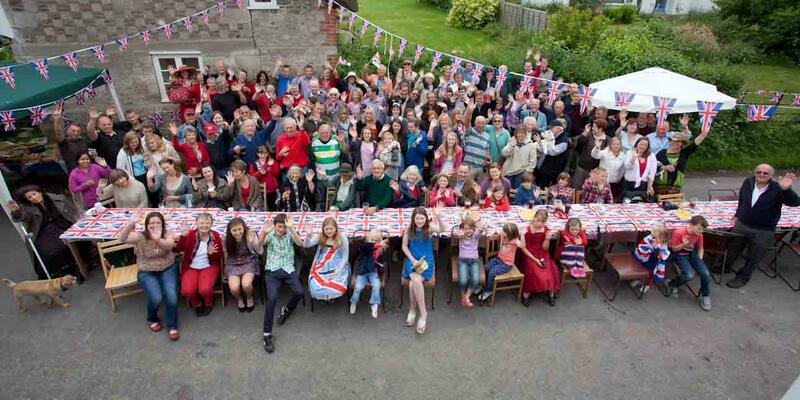 The River Cottage Diaries: What a Jolly Jubilicious Jubilee that was! What a Jolly Jubilicious Jubilee that was! Phew. Breathe. It's all over (and by the time you read this, probably long over - in fact, you'll probably be preparing for the next one). 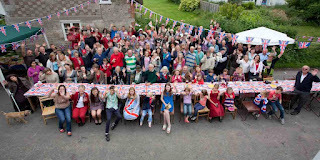 The village feted our Lizzie's 60 years on the throne in happy and glorious style. She'd be proud of us. I live in the most wonderful, batty village. I've said it before and I'll say it again. There's no place like it. It's a weird and wonderful mix of artisans, writers, artists, World of Warcraft Guild Masters, pig breeders and honest, decent folk but most of all it's a community. And we like nothing better than a good community event to get us all out of hour houses and onto the streets (without an ASBO in sight). After a few village meetings, we decided to have a cricket match on the Saturday against a neighbouring village - although I think someone forgot to ask them first - and then on Monday, it would be a street party. The village swung into gear like a military operation but far more enjoyable. We had high hopes for good weather after the steaming weekend before when we had the Vintage Nostalgia Show but as it got nearer, it became clear that we were not going to be quite so lucky. They say the sun shines on the righteous, and we must be a pretty righteous bunch because Saturday dawned relatively fine and clear after the monsoons of the previous days. A tractor and trailer took everyone down to the pitch, it being a bit of a walk for some people, and the cricket was downgraded (or up, depending on your school of thought) to a rounders match due to lack of opposition. Although some were a little disappointed not to be getting their best whites on, they soon entered into the spirit of the game and what started out as a bit of fun, became very competitive. Dodgy 'out' calls were made and the bowling became a little creative as each team attempted to nobble the other - all in the spirit on fun, you understand. The rain held off, the beer flowed at half time and everyone had a thoroughly enjoyable afternoon. So much so that we've decided to hold another couple during the summer. Sunday saw a return of the monsoon weather and many anxious hours were spent glancing skyward, checking weather apps on phones and crossing fingers and toes but on Monday the skies had once again cleared and the sun was peeping through. While is wasn't a balmy summer's day, it was certainly a huge improvement on the rest of the week and although black storm clouds threatened a few times, not a drop of rain fell on us. By 8am, people were out in the street setting up tables, our local hog was roasting away on a spit, the bunting was being strung, all 360 metres of it, and there was a definite festive air to the village. By 9am the food tables were groaning with a vast assortment of delicious food - so much for our worries that we wouldn't have enough. What we didn't have enough of was tables to put it all on. The generosity of our fellow villagers was truly overwhelming. As midday got nearer, the street started to fill up with people from the village, from neighbouring villages, who clearly recognised another superlative Stockton event, extended families from all over the country and to the gentle sound of some 1950s tunes, friends greeted each other, renewed acquaintances with people that hadn't seen for a while or just got to know some of the newer arrivals in the village. Who says community is dead? Not in our village, it's not. The hog was divine; juicy meat, full of flavour that had people begging for more. What a difference there is between a locally-raised pig and the bland stuff you get from a supermarket. 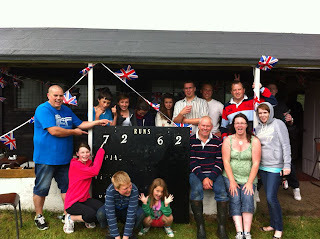 Hats off to H and S at our very own Moonraker Meats for their superlative pig-raising skills! Her Maj was duly toasted and a jolly good lunch was had by all. Once we had had a chance to let it all go down it was over to the orchard for the dog show where waggiest tails, biggest dogs, best trick and best in show were being judged amid much banter between owners and oohing and aahing over the entrants - the four legged ones, that is. Then it was on to the much talked about Village Tug o' War which went from being a mixed event to Men v Women (silly men!). Needless to say, a bunch of mere men are no match for the feisty ladies of the village and we beat them easily.The men would say that the fact we were pulling them downhill had some bearing on it, but then they would, wouldn't they! Then it was the Children's Olympics (yes, we said children, all you ultra-competitive adults!) - and you didn't have to pay £100 quid for a ticket. 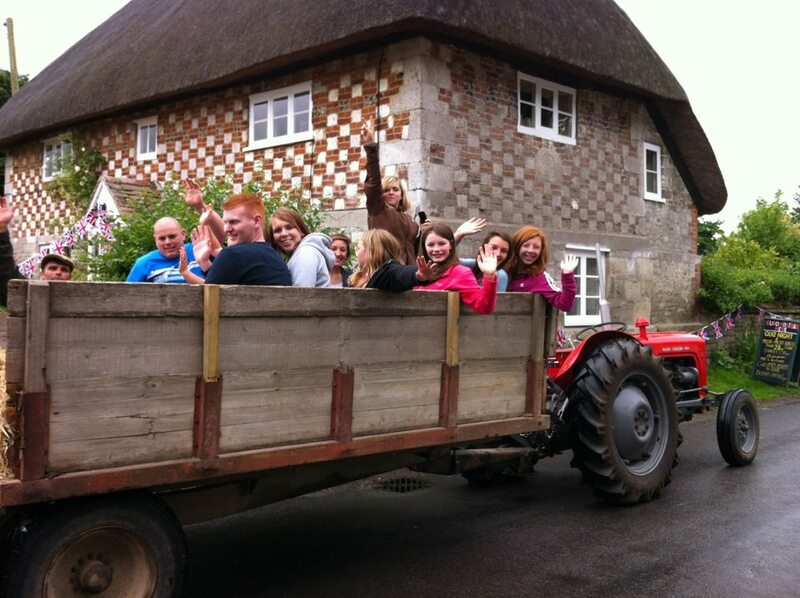 The village certainly has some talent and there are some definite hopefuls for the 2016 Olympic Egg and Spoon race. 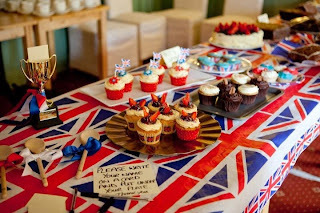 Then it was all over and it was back to the pub for the grand finale, The Stockton Queen of Cakes Bake off. I was asked to judge it, my WI credentials apparently being perfect for this. If only people knew the truth. I last baked a cake in about 1986 and it was an abject failure, well, unless you count the Betty Crocker ringer I made a while back. Manfully aided by two chaps from the village, we headed off to do our judgely duties. By this point, the cake table had swelled to about thirty entries and we had to taste them all. By the time we got to about number twenty three I was feeling decidedly nauseated, despite only having a tiny mouthful of each one. Just enough to get the taste of it, you understand. Talk about taking one for the team! I have to say, my fellow judges took it very seriously and there was much discussion about texture, colour and lightness. There were three categories, Victoria Sponge, My Best Cake and My Six Best Cupcakes. The Rocky Road biscuits which one the 'Best Cake' (and there was much head-scratching about whether or not they were cakes) were superlative, and they weren't even supposed to be in the competition. They had been brought for the communal food table until it was decided they looked to good. The eventual Queen of Cakes was.... the wife of one of the judges but it was completely anonymous and even if he had abstained she still would have won because it was a unanimous decision. And then it was all over. The remaining cakes were wolfed down with tea and coffee then it was back out into the sunshine to clear up and chill out. It was a wonderful day when new friendships were forged, old ones renewed and we celebrated something quintessentially British in an atmosphere of community goodwill. Wow! I'm moving to your village [village said in French accent... nudge, nudge] Just ignore me I'm 'zausted. Anyhoo, your eventastic Jubilee sounded wonderful. We, on the other hand, had a brilliant lunch in a polytunnel on the Sunday but eventually had to give up when a river began to course through under the table. Let's get together soon when the weather improves... 2014 OK for you? Jubilicious Jubilee indeed. You English know how to celebrate as it should be done. What fun. I was able to participate in street parties, etc. just once and that was for the wedding of Charles and Diana. Of course, we all know how that turned out.